Dozens of Scholarships Signed Each Year! Q. Which event put Eddy Pineiro on the map? A. The Kornblue Showcase. Before Eddy received scholarship offers from Florida, Alabama, Georgia, & Miami, he needed a stage to showcase his talent. He had never kicked a FG in a game. 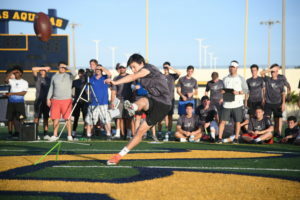 At the Spring 2015 Kornblue Showcase, Eddy blasted an 86 yard kickoff and hit a 71 yard FG off the crossbar. Because we capture HD video of every kick, punt, and snap at the event, coaches were able to SEE what Eddy was capable of. Eddy went on to become the most accurate kicker in UF history & is currently kicking for the Oakland Raiders. Q. Andrew Lunsford never played HS football. How did he receive full scholarship offers from several FCS & D2 schools? A. The Kornblue Showcase. A longtime soccer player & track star, Andrew started his football kicking career after his senior season of high school. 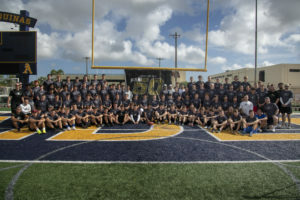 Despite never playing a down of high school football, Andrew performed well enough at a Kornblue Showcase event to impress several coaches with the video from the event. Q. Kyle Brindza was offered scholarships from several D1 schools. Notre Dame & Michigan offered him the opportunity to leave high school after his junior year to play for them. How did that happen? A. The Kornblue Showcase. Despite the fact that Kyle attended nearly every Fab 50 Camp we offered in his area, Kyle demonstrated his best numbers at our Kornblue Showcase event. The numbers and video from the event are what convinced coaches that he was as good as advertised. Q. Justin DuVernois was offered multiple scholarships before he ever started a high school game. Which camp earned him national recognition? A. The Kornblue Showcase. Justin played for one of the nation’s top high school programs at St. Thomas Aquinas in South Florida. He had Division 1 talent but was playing behind one of the nation’s top prospects (NFL punter Michael Palardy). 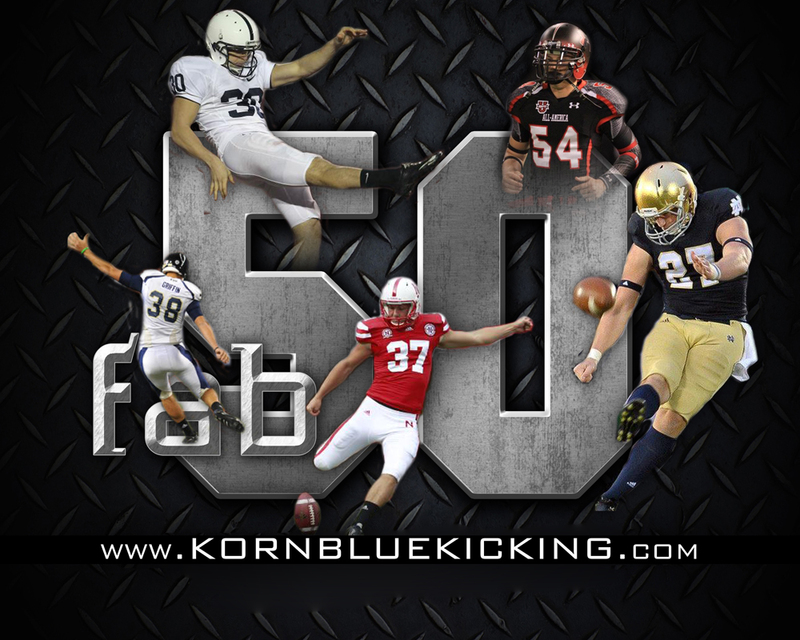 Justin performed well enough at the Spring 2010 Kornblue Showcase to earn a spot in our Fab 50 as the #2 ranked punter in the nation. Within months, he received scholarship offers from Illinois and Kansas before he had ever started a high school game. Q. Jack Griffin didn’t kick during his senior season because of a fractured back. Which event helped him earn a full scholarship to FIU? A. The Kornblue Showcase. In our inaugural event in Fall 2007, Jack made a 60 yard FG in competition to showcase his ability as a high school junior. Jack performed well at several other national kicking combines but wasn’t fairly ranked or promoted. Despite his injury, we kept him ranked in our top 5. Jack went on to become a Sports Illustrated All American and the all-time leading scorer at FIU. If you can only attend one of our exposure events this year, this is the one! Those who perform the best at our Kornblue Showcase & Fab 50 camps are recognized in the Fab 50 National Rankings. 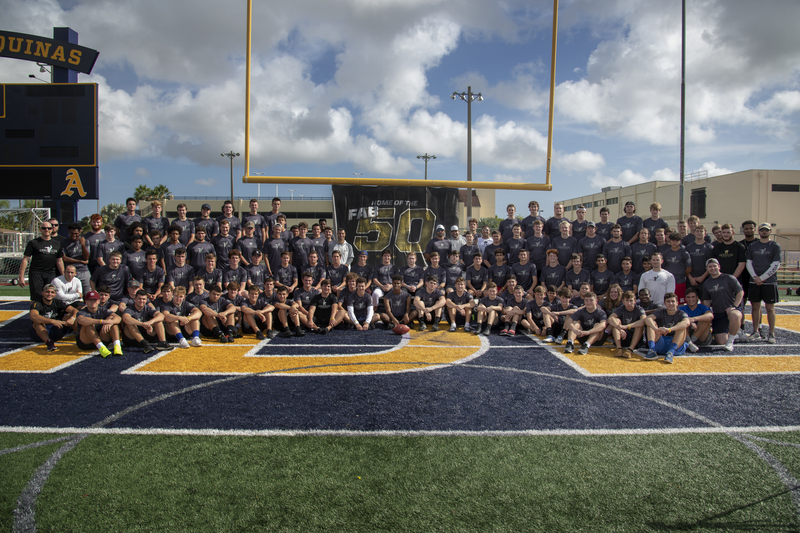 The Fab 50 is actively promoted to college coaches and annually helps dozens of kickers, punters, and snappers receive college scholarships. 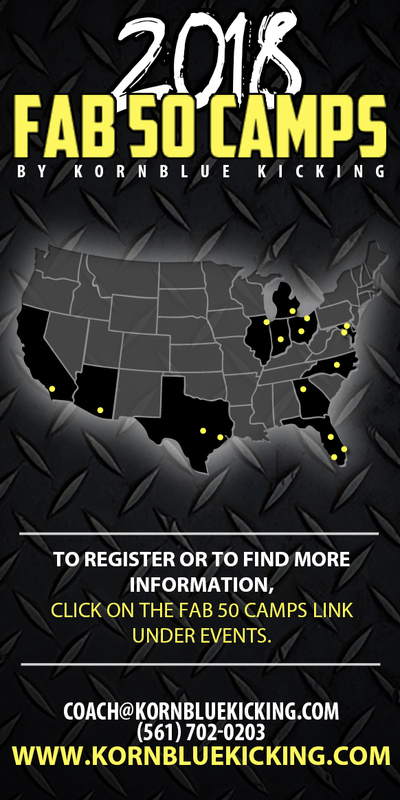 The training and exposure we provide produces many of the nation’s top recruits every year. Kornblue Kicking-trained athletes have received scholarships to every major Division 1 conference in the country. 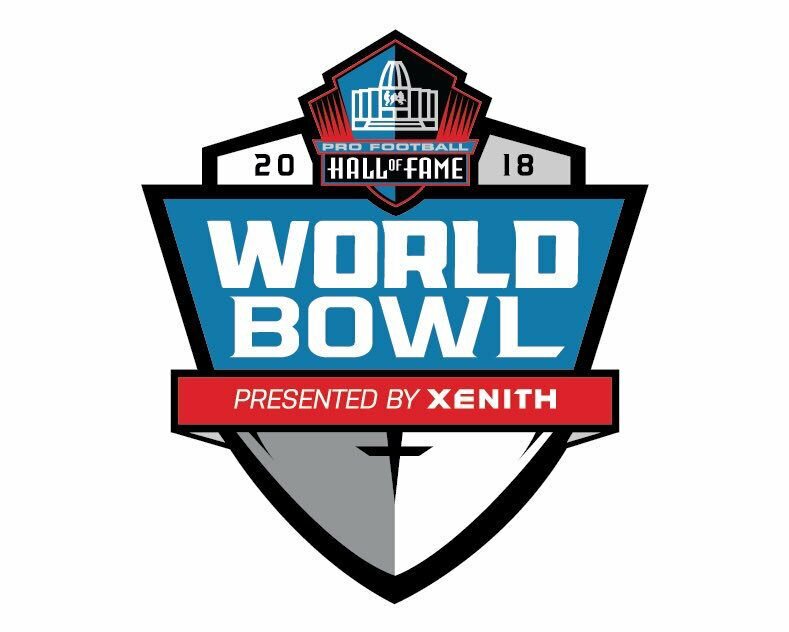 We select the specialists for the Pro Football Hall of Fame World Game (HS seniors) & the 8th Grade All American Game. Results from this event are posted on Scout.com’s national recruiting page. Click here to view the link to the Scout.com summary. Maximize your opportunity for college scholarships by competing in this recruiting/exposure event! This is a competition-only event. Competing in this event is the single best way to showcase your ability for the chance to be ranked for the first time or improve your spot in the Fab 50 National Rankings. Kick, punt, or snap in ideal conditions…warm weather on a turf field. To purchase the video, please pay below. 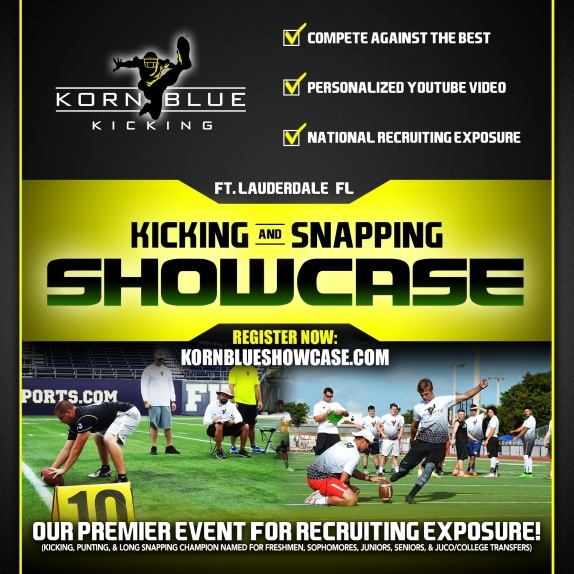 The video will be edited to include your best kicks, punt, or snaps from the camp. 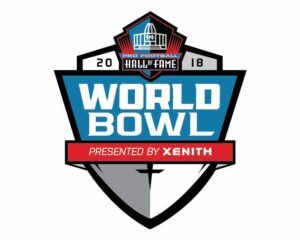 Similarities between the Kornblue Showcase & the NFL Combine? Read here what an NFL coach had to say. 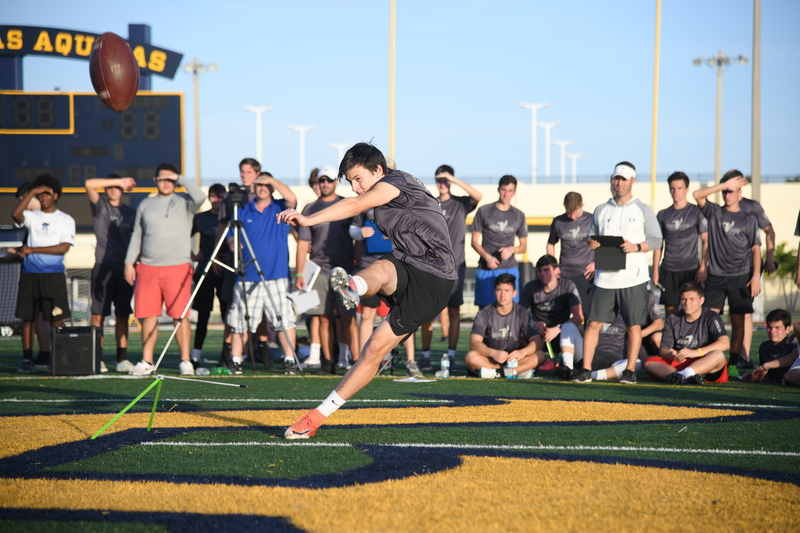 One KICKING CHAMPION, one PUNTING CHAMPION, & one SNAPPING CHAMPION will be named for each grade level (youth, freshmen, sophomores, juniors, seniors, college/JUCO). The KICKING CHAMPION will be crowned based on the combination of FG and Kickoff points. Punting and kickoffs will be charted first. Field goals will be the last event. First, all kickers will be charted on five kickoffs. The best four will be scored. Hangtime will not be factored into the scoring, but will be charted for recruiting purposes. The field goal competition will be double elimination. Every kicker will start with a PAT with a snap and hold. Thereafter, kicks will be attempted alternating left and right hash. The order is 30 – LH, 30 – RH, 40 – LH, 40 – RH, etc. Kickers move on to the next attempt until they have missed twice. Each made kick = 1 point. The LONG SNAPPING CHAMPIONS are determined by a point system which combines accuracy and velocity and includes post snap responsibilities.